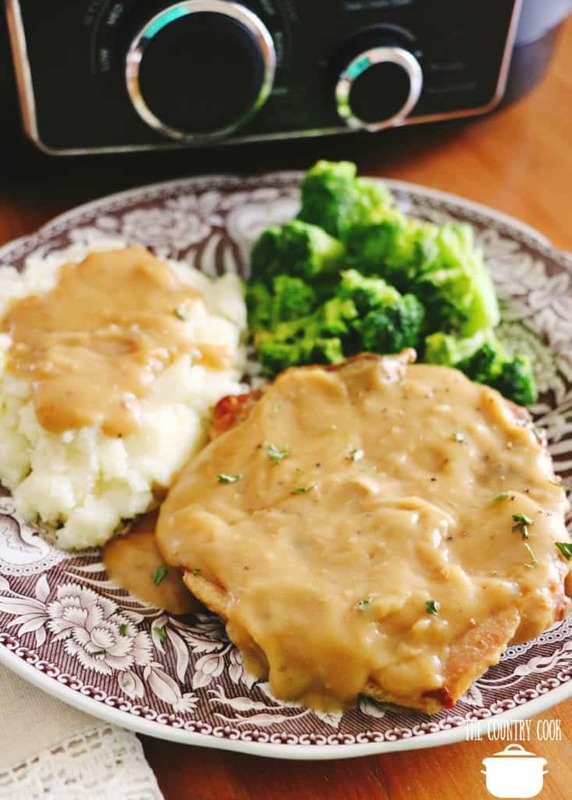 This super simple recipe for Crock Pot Pork Chops with Gravy is the most popular recipe on The Country Cook. 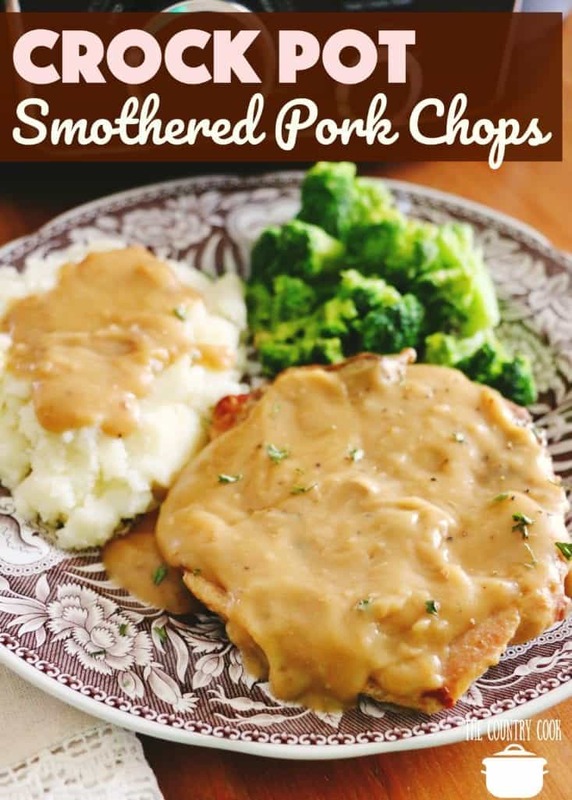 Super tender pork chops cooked in an easy, creamy sauce. 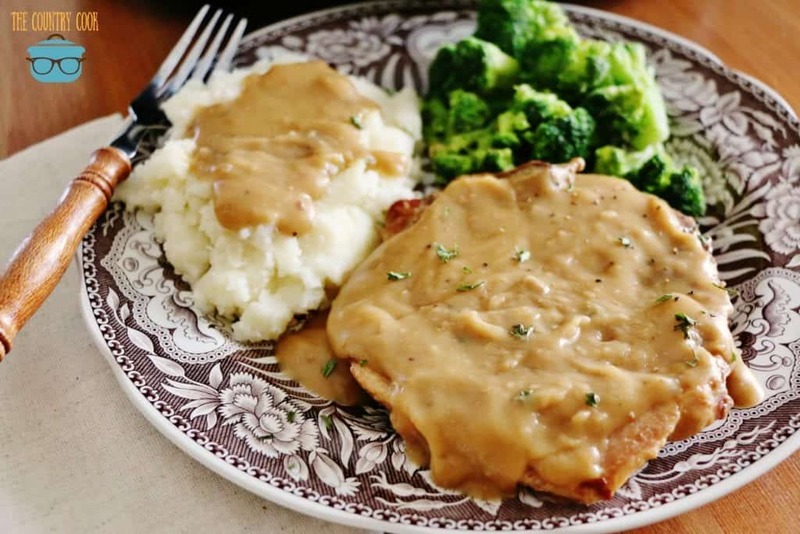 The gravy can be used on the pork chops and also on delicious mashed potatoes as a side. Check out my Crock Pot Million Dollar Mashed Potatoes. It goes perfect with these chops! This is one of those fix-it and forget it type crock pot recipes. It helps to have a digital crock pot these days. You can cook it for a certain amount of time so and then it will automatically go to a keep-warm setting. This is awesome if you’re at work all day and don’t want to come home to overcooked tough pork chops. Slow cookers are so smart these days. 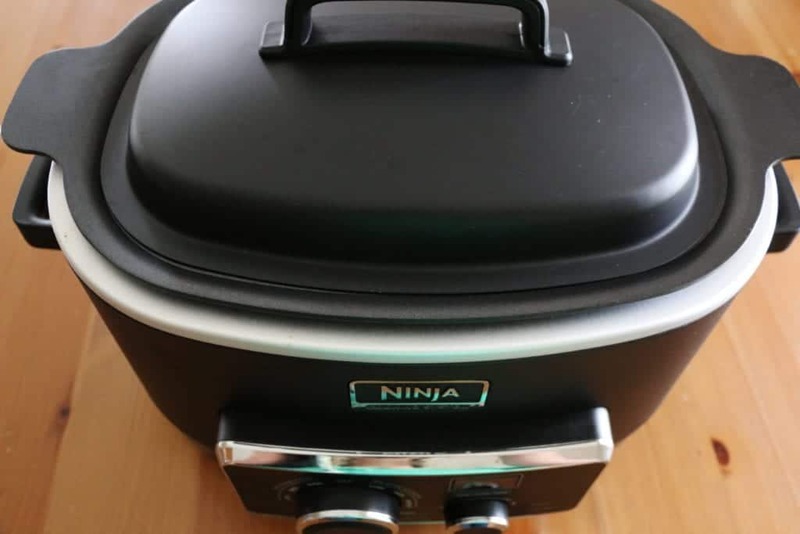 The Ninja brand slow cooker is one of my faves. Note: I like the bone-in pork chops for this recipe. I find that it really gives this dish a lot of flavor but if you prefer boneless you can certainly do that. But I definitely do not recommend a thin cut pork chop. Just be careful when taking them out when they are finished cooking. The meat will be very tender so I like to scoop them out with a spatula. 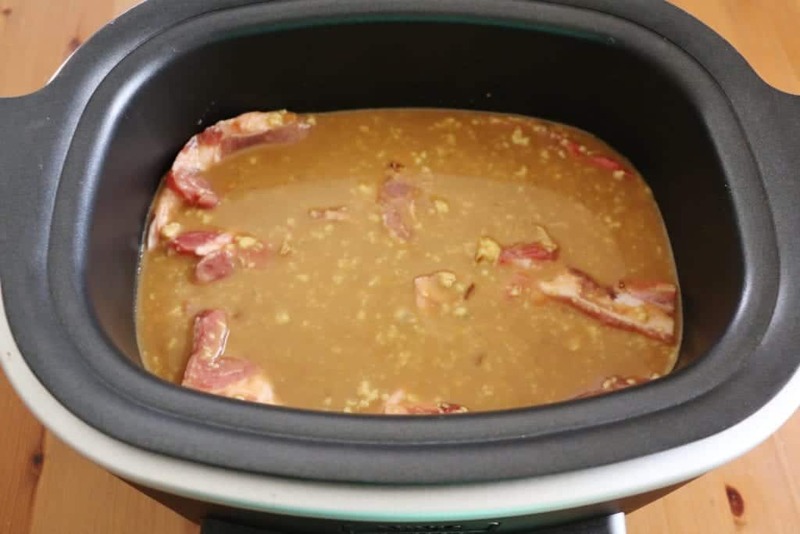 In a 5-6 quart slow cooker, combine onion soup mix, chicken broth, cream of chicken soup and pork gravy mix. Whisk together until combined. Don’t worry about any lumps, they will go away during cooking. Note: I find this works better in an oval slow cooker instead of a round one. The chops cook more evenly. Season both sides of the chops with a little bit of garlic powder. 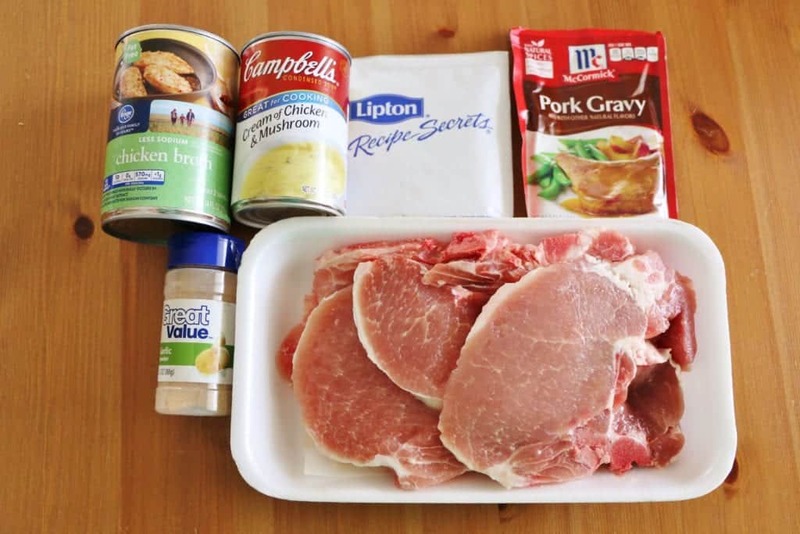 Place pork chops into the slow cooker. Do your best to spread them out and cover with the gravy mixture. Just before the pork chops are done. 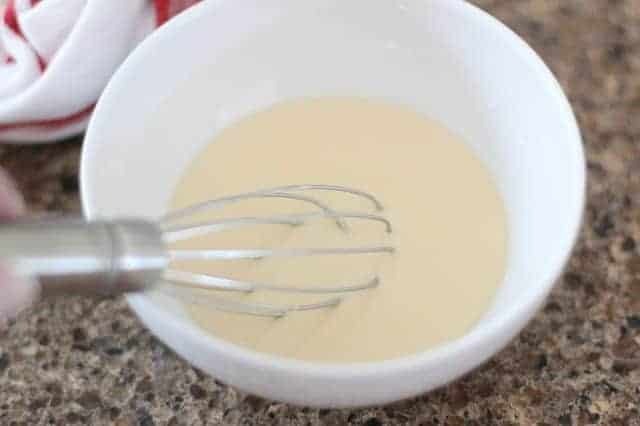 Whisk together the corn starch and cold water in a small bowl. Once it is smooth, pour it in with your pork chops in the slow cooker and stir gently. Cover and switch the slow cooker to high and cook for another 30 minutes (until gravy has thickened.) Then serve with mashed potatoes! 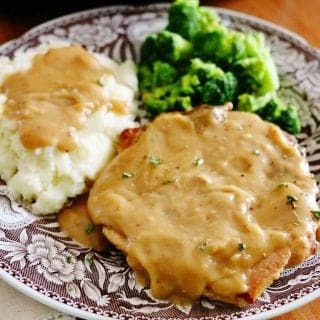 Crock Pot Pork Chops with Gravy are so yummy and tender and the gravy it makes is lip-smacking good. One of my family's absolute favorites! 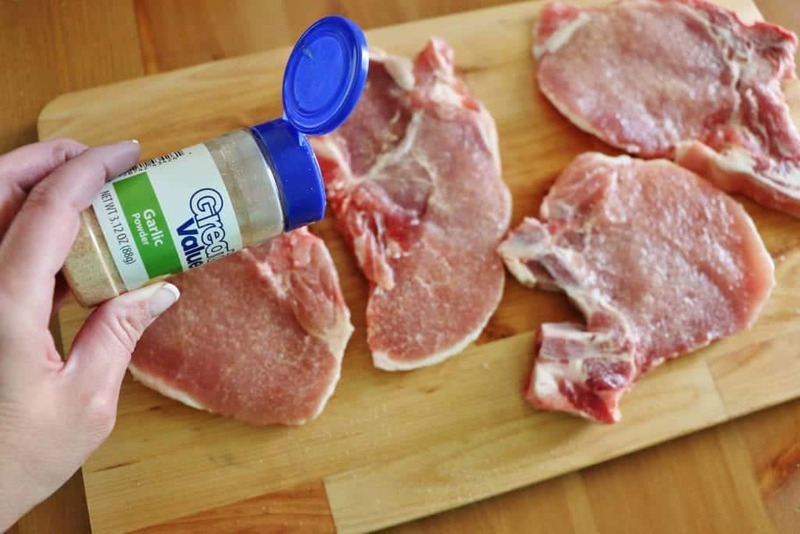 Craving more easy pork chop recipes? These are some of my favorites! Woo hoo! That is so great to hear Deborah! Thank you for coming back to let me know! Could this be modified for the instantpot and if so, what would you recommend? Thanks so much for replying with an answer Angie! On the nutritional value of this dish, is it for 1 porkchop or 4? Maggie it is for one serving of pork chop, gravy and a side of potatoes. 🙂 Although, I always recommend folks use their trusted nutritional calculators as this is just provided as a general guideline and should not be used for people with health concerns. Please consult your own nutritional calculators. Made these last week and we loved them. The meat was so tender and the gravy was wonderful. I am making them again this week.. Thank you for the recipe. This is one of my most favorite recipes on my site. So happy you love them too!! The soup is too salty for us because of health reasons. What do you suggest we could do in place of the soup? This recipe looks absolutely delicious and I use my crock pot a great deal. Your suggestion would be appreciated so much. Thank you! For some reason every time I make it, especially today. It always ends up tasting like corn starch.. I always follow the instructions.. any suggestions? Lacey, I have never had this issue (since cornstarch doesn’t have a flavor) but it may be that you are just sensitive to it. I know people who are super sensitive to ingredients like baking powder (they will sometimes say it tastes like aluminum.) So, you could use a few substitutes for thickening your sauce. You could use a super-fine flour like Wondra brand flour. Or, perhaps try using wheat flour or arrowroot. It might be something you can play around with. Hope that helps! This is one of my family’s favorite recipes! I make it at least twice a month. Even my picky 3-year-old gets excited when he hears that pork chops are for dinner! Alyssa – yay!! Loved reading this!! That is one of the highest praises – when the picky 3-year old loves it!! Adorable!! My family loved it. They said the gravy was great!! Woo hoo!! Thanks so much Alesia. Love hearing that! So good, especially over mashed potatoes. Could you add small potatoes to this?